Royal officials accepted condolences from around the world as Britain mourned Princess Margaret on Saturday. The mood was somber outside Buckingham Palace, the home of Margaret's older sister, Queen Elizabeth II, as tourists and well-wishers filed past the ornate gates, many only learning of Margaret's death from a notice posted by officials. Public response was far more muted than the outpouring of grief and shock that followed the death of Princess Diana in 1997. Margaret had long been out of the spotlight, and her declining health, including a stroke in February 1998 and another in March 2001, was well publicized. Many mourners expressed empathy for the princess' travails, including her health problems, her troubled love life and her struggle to find her place in the shadow of her sister the queen. Saturday morning television broadcasts were interrupted to report Margaret's death, but normal broadcasting resumed within two hours. Tennis fans observed a minute's silence before a Davis Cup tie between Britain and Sweden in Birmingham. Crowds at several soccer matches throughout the country also observed a minute's silence before their starts. 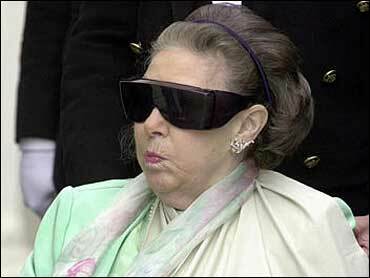 Friends and family remembered Margaret as a high-spirited royal who was also committed to charitable work. My darling aunt had such a dreadful time the last few years with her awful illness and it was hard for ... her to bear it ... particularly as she had such a wonderfully free spirit, he said. Margaret, the fun-loving, hard-playing sister of Britain's Queen Elizabeth, died on Saturday at 71 after the latest in a line of strokes. The queen announced the death of her younger sister with great sadness in a statement pinned up for all to see at Buckingham Palace, where the Union Jack fluttered at half mast. Margaret's death robbed the queen of a loyal confidante and ended a lifelong battle between protocol and passion. Curious tourists congregated outside the palace gates in muted sadness and respect  a far cry from the spontaneous outpouring when Princess Diana died in 1997. Margaret died in the week her sister celebrated 50 years on the throne. Ever more vivacious than the dutiful Elizabeth, Margaret's exotic lifestyle had in the end reduced the glamorous princess to a frail, wheelchair-bound figure. The palace said Margaret suffered her most recent stroke on Friday afternoon, developed heart problems overnight and as taken from her Kensington Palace home to hospital. Her beloved sister, Princess Margaret, died peacefully in her sleep this morning at 6.30 a.m. in the King Edward VII Hospital. Her children, Lord Linley and Lady Sarah Chatto, were at her side, the queen's statement said. A heavy smoker and drinker, Margaret will best be remembered for relinquishing true love in her youth, turning her back on a dashing air force officer when protocol dictated that a princess could not marry a divorced man. Instead she turned her attentions to the high arts, beaux and parties, in striking contrast to the outdoor sporting pursuits preferred by other royals. The funeral will take place next Friday at St George's Chapel in Windsor Castle. Members of the royal family and friends will attend the ceremony, which will not be a state occasion. A memorial service will be held at a later date. The death comes as the royal family embarks on a year of jubilee celebrations for the queen's 50-year reign. Plans have got off to a bad start, with widespread apathy about the festivities and fresh scandal surrounding the younger royals. The death will be a bitter blow to the family matriarch, the Queen Mother, who at 101 has now outlived her younger child. Right to the end, the Queen Mum, Elizabeth and Margaret had formed a fierce female trio at the heart of the monarchy, while younger royals dabbled in divorce, adultery and drugs. Always the more striking sister, Margaret barely appeared in public at the end and final outings revealed a woman destroyed. Unable to walk, a formless figure bundled in blankets and wraparound dark glasses, this was not the wild child who had broken so many hearts or cavorted with so many stars. A series of strokes had damaged her eyes and affected one arm. Her wheelchair became Margaret's lifeline. Surgeons removed a section of the princess's left lung in 1985 and there was speculation that her condition had been brought on by smoking up to 60 cigarettes a day. In 1999, she was ill for weeks after scalding her feet while taking a bath. A friend of celebrities and lover of night clubs, the sharp-tongued princess was the first in a line of modern royals who struggled against the stuffy strictures of regal convention. She loved ballet, art and jazz  Louis Armstrong dubbed her one hip chick  but it was her zeal for the Caribbean island of Mustique, men and partying that captured the imagination. Yet for all her bohemian instincts, Margret gave up her one true love in 1955 when she yielded to pressure by renouncing her love for the handsome but divorced Group Captain Peter Townsend. Constitutional crisis averted, the distraught princess turned to a flamboyant life in high society for consolation. She wed photographer Anthony Armstrong-Jones  who took the title Lord Snowdon  in 1960. Their marriage produced two children and ended in 1978. It was the first divorce in the inner circle of the royals since the days of King Henry VIII, and presaged the royal discord of recent years. Margaret was 11th in line to the throne. Several bouquets of flowers were placed outside the gates of Kensington Palace by members of the public. In our Earth Matters coverage, we take you around the world to see how all seven continents are dealing with major issues affecting our planet. CBS News climate and weather contributor Jeff Berardelli joins "CBS This Morning" to discuss what you can do to help. A major energy crisis is affecting millions of people's livelihoods in South Africa. Widespread blackouts cost the country's economy up to $284 million every day. But the energy shortages are also spurring a new generation of entrepreneurs, creating a $19 billion solar power industry. Debora Patta reports from just outside Cape Town as part of our Earth Matters coverage. In our Earth Matters coverage, we go to Antarctica's "Iceberg Alley" aboard a one-of-a-kind scientific drilling vessel. Researchers from around the world on the JOIDES Resolution are investigating the climate history of Antarctica. We also take you to the U.S. outpost at Palmer Station where the scientific support team is helping American researchers during the Antarctic winter. Extreme weather is becoming more frequent and more widespread around the country. California suffered the worst wildfire season in history last year. In January, the Midwest saw record-breaking cold. Historic flooding in Nebraska last month caused more than a billion dollars in damage. CBS News climate and weather contributor Jeff Berardelli joins "CBS This Morning" to discuss why changes in the Arctic are having a big impact here.